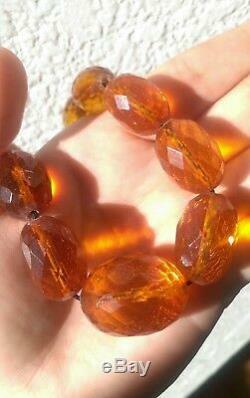 Very Large Faceted Amber Necklace. 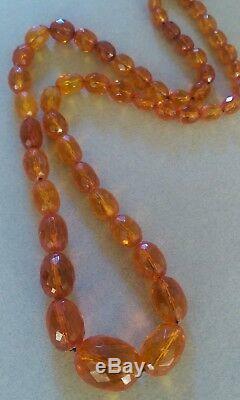 Largest bead measures 28.5 mm x 21.5 mm. Smallest bead measures 10 mm. The necklace weighs 69 grams. Weight may be a gram over or under. The condition is good, with some chips to the beads. Please take a look at the images for condition reference. 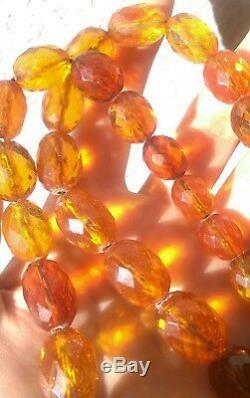 Some crazing as should be expected with older natural amber beads. Prices went up, the cost being charged is what will be paid for the service. I do not keep any of it! Any questions, please feel free to ask and I will reply promptly. 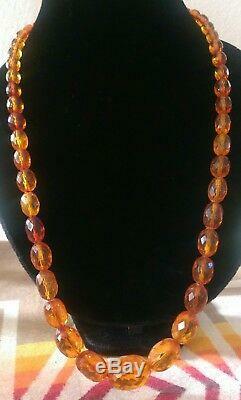 The item "FACETED NATURAL BALTIC HONEY AMBER BEAD NECKLACE 69 GRAMS" is in sale since Saturday, November 11, 2017. This item is in the category "Jewelry & Watches\Vintage & Antique Jewelry\Fine\Retro, Vintage 1930s-1980s\Necklaces & Pendants". The seller is "acanedo70" and is located in Stockton, California. This item can be shipped worldwide.